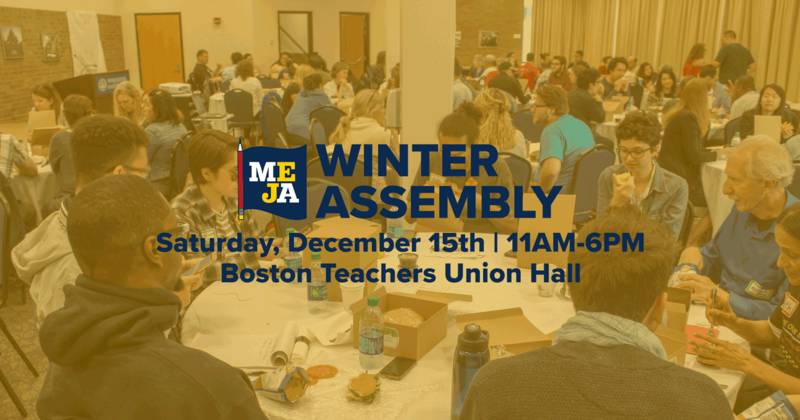 We're bringing together the students, parents, educators, and the whole MEJA community for a MEJA Winter Assembly. Building off of our statewide convening in the summer, we will be planning our path forward for the new year, talking about the campaign to fund our public schools and colleges, and holding sessions on testing, privatization, student debt, the school-to-prison pipeline, student power, and much more. We will hold youth-only breakouts, a PHENOM meeting, and other special sessions by member organizations. If you have any questions, do not hesitate to email us at info@massedjustice.org. We cannot wait to learn, build, share, and join in the fight with you.